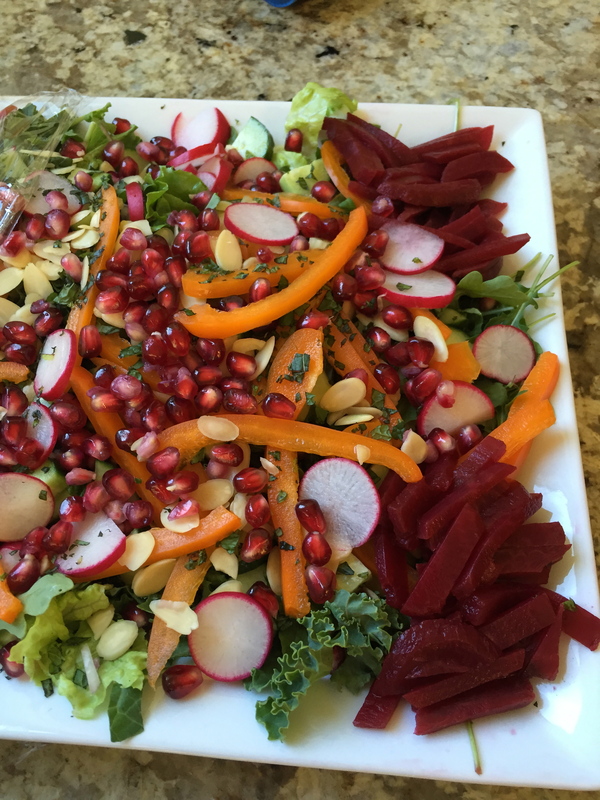 The key to this salad is colour and texture. 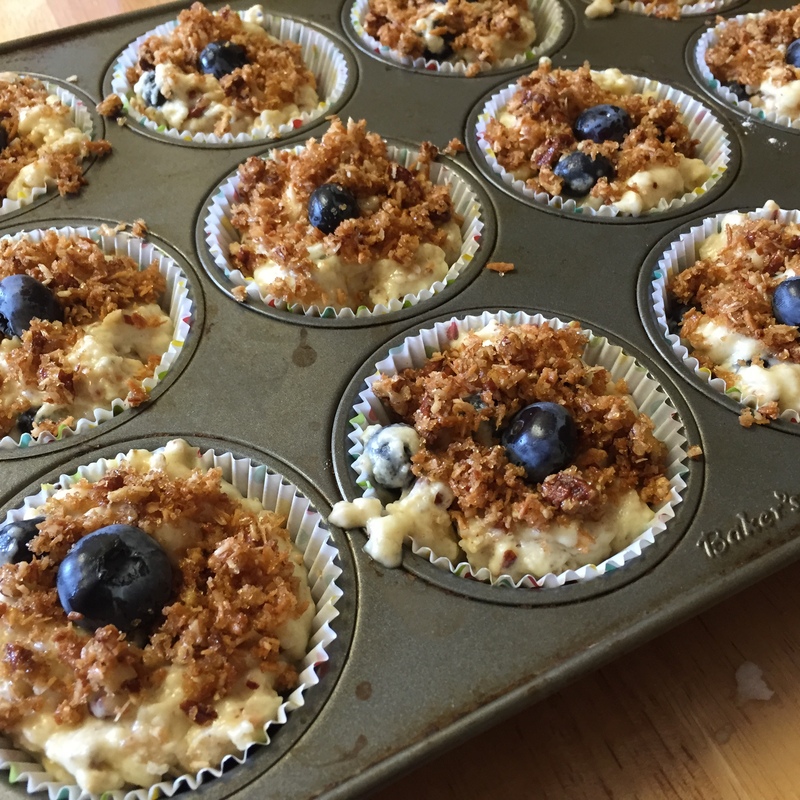 Make sure you use some fruit (pomegranate seeds are awesome), and lot of different textures. Try a variety of techniques in your vegetables also – some grated, some julienned, some sliced – you get the idea. Add a cooked protein and you have a simple, whole meal. We’ve been lucky enough to have Lorellei bring this to a few family dinners now, and it has definitely become one of our requested salads. If you can’t get sumac in your area, grate in a little extra lemon zest. Blend all ingredients well and taste – adjust seasoning if needed. Just suggestions really, come up with your own ideas .. Try either of these vinaigrettes, easily done and keeps in the fridge to be your own “house dressing”. 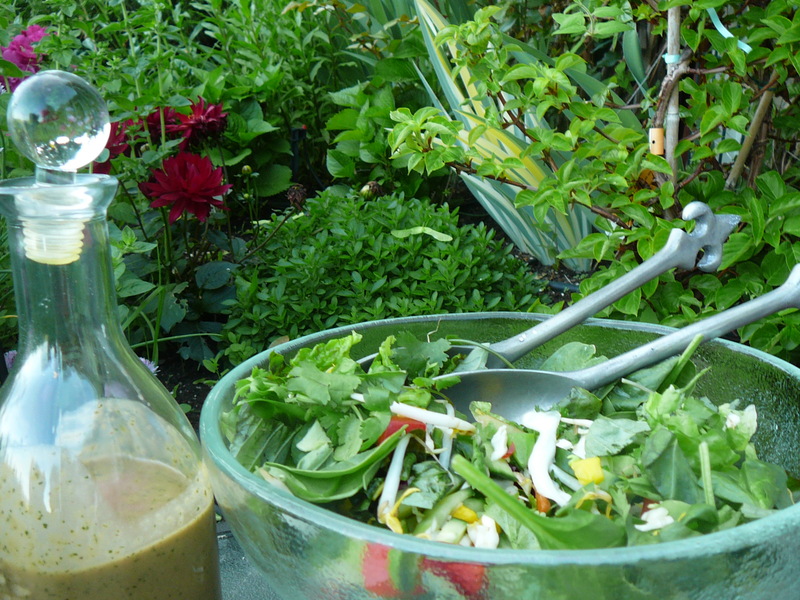 I love making my own salad dressing vinaigrettes – and when the herbs are fresh and growing right outside my back door it is even more fun. These recipes are written for whisking by hand – but if you have an immersion blender they will create a deliciously creamy dressing. Here are a couple of my herby delicious faves. Whisk well, and then slowly drizzle in 3/4 cup good quality extra virgin olive oil. Season to taste with more salt and pepper if needed. Whisk well, then slowly drizzle in 3/4 cup good quality extra virgin olive oil. Taste!! Season with more salt and pepper if needed. I’m really going to try and simplify a few meals …. seems as though I look at 20 or 30 minute meals and only use that as a starting point … always adding more dishes. Next thing I know I’m looking at 60 minute meals … Usually that is just fine, it is my kitchen yoga after a busy day at work. 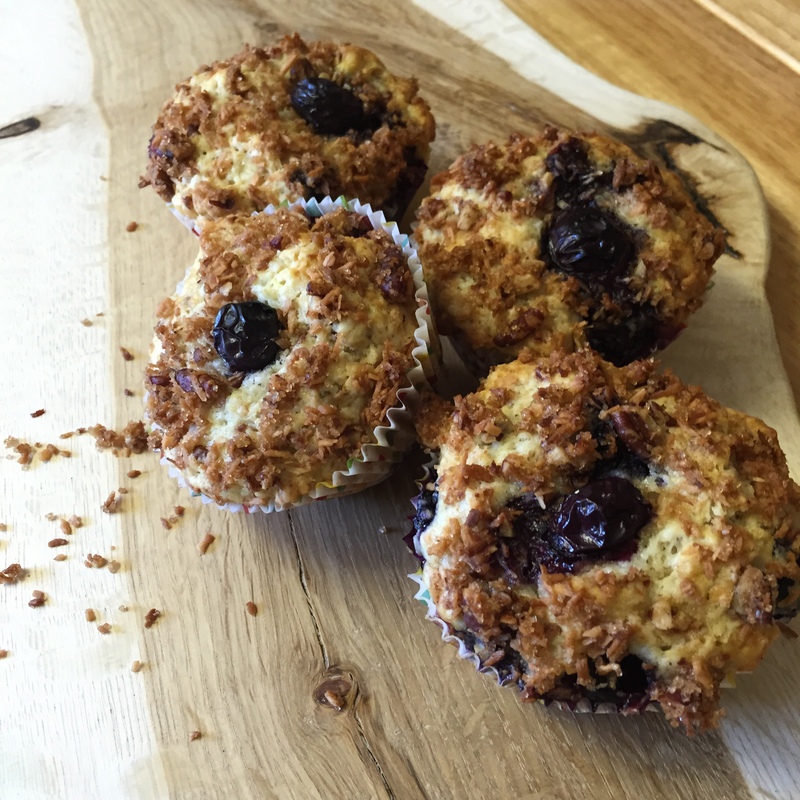 However – sometimes, like when my beautiful Sloan and Stella are helping out, a 20 or 30 minute meal is the way to go. Freshly harvested corn, spinach and tomatoes make this deliciously simple pasta dish extra tasty. 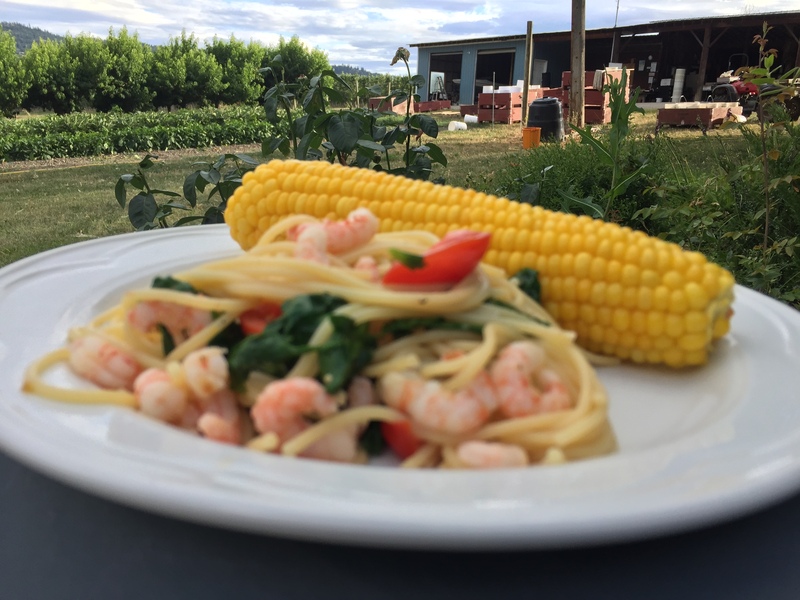 Here is one for you to try – deliciously simple and when made with fresh tomatoes and spinach out of the garden, not to mention the first of this years corn, it really is enough. You can use any pasta you like for this – the main point is to cook it in enough salted water – be generous with that salt, and have lots of water. Cook pasta until al dente. Cook pasta in boiling water, in the last few minutes of cooking time, toss in the shrimp and cook ONLY until the shrimp is opaque and slightly pink throughout. Neither pasta or shrimp do well when overcooked. Drain well, reserving a bit of the pasta water in case needed. Return to pot and add in freshly grated lemon zest, the juice of 1 lemon, chopped fresh tomato, 2-3 tbsp olive oil and the 4 cups of baby spinach. Season to taste with salt and pepper. If it seems a bit dry, this is the time to add a bit of the pasta water. Parmesan cheese grated over finishes it all off. Served with the fresh corn on the cob it really is a great meal – quick and easy too. 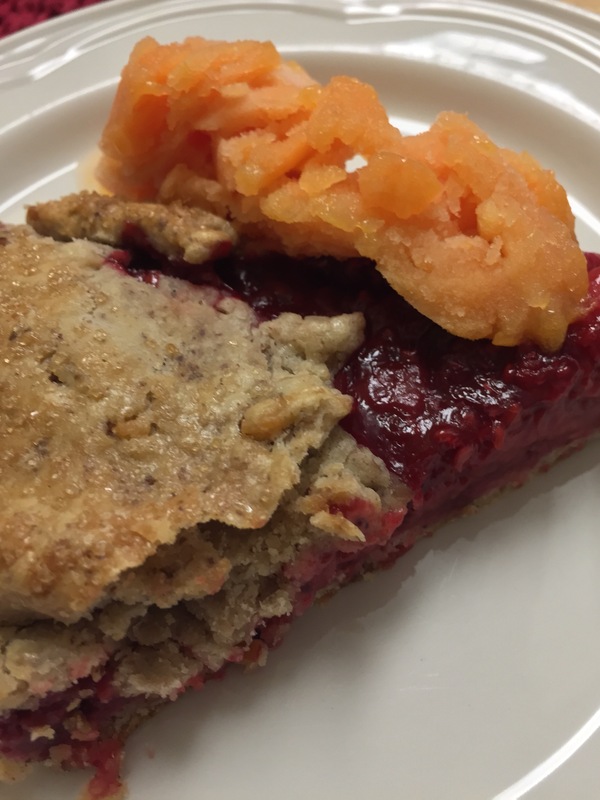 This recipe works really well with any berry or fruit – the pecans give the pie crust a rich, nutty, crunchy texture and flavour. Really – what is a galette? An easy way to make a pie! 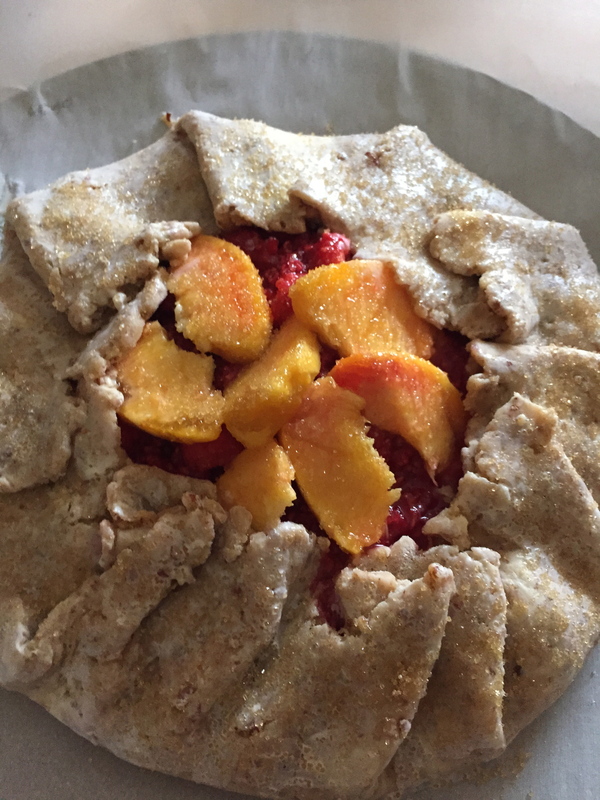 Ready for the oven, this raspberry peach galette looks delicious already. Toss raspberries, cornstarch, lemon juice and 1/4 cup sugar in bowl. Roll out dough on a lightly floured surface to a 12″ round. Carefully put on a parchment lined baking sheet. Mound fruit mixture into centre of dough, leaving about 2″ around the edge. Fold edges over, overlapping slightly. Brush dough with milk or cream and sprinkle raw sugar over. Peel, and slice peach – in the center opening, arrange peach slices. Bake until crust is dark golden brown and filling is bubbling – at least 45 minutes. 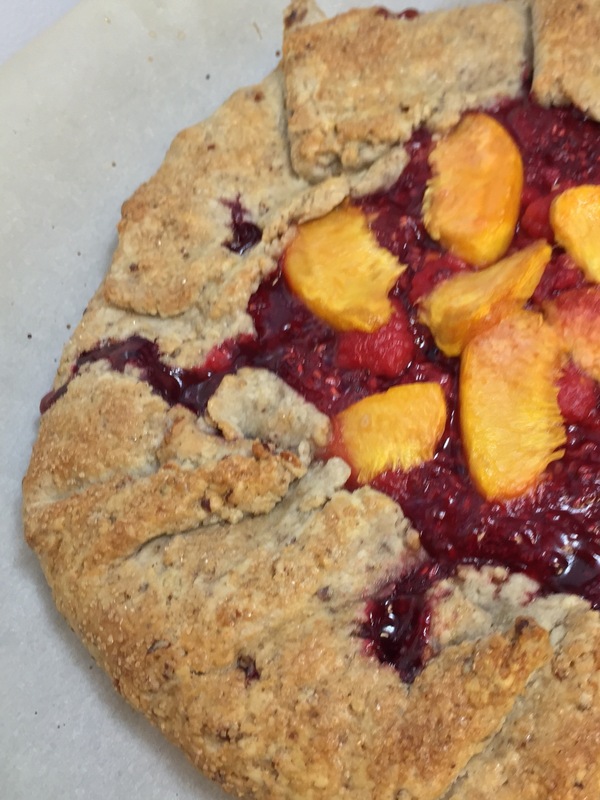 Fruit bubbling and oozing, crust golden brown ….. difficult to wait for it to cool before slicing! Peaches and raspberries were ripe and ready at the same time this year, so I served this with a yummy peach bursting sorbet …..